A warm neck goes a long way when there are temperatures below freezing and 40 MPH winds. 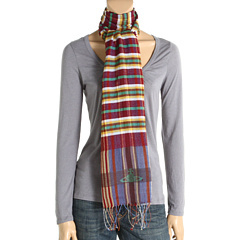 Cover yourself up with a stylish scarf and keep that chill from cooling you to the core. With over 7 ways to tie it, a scarf can be a winter survival essential and a risk free fashion statement. 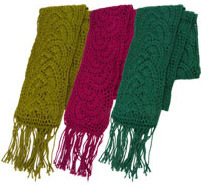 Not only is this colorful scarf perfect for fighting frostbite, it's also bright and cheerful enough to warm your mood as you clear those 18 inches of snow from your car. Who doesn't love pom poms? This warm knit scarf is grown up and mature looking but the fun and playful pom poms makes us smile as we think back to childhood snow days. 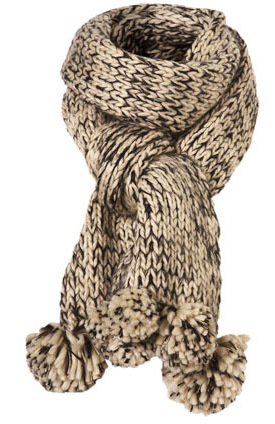 Here are some scarves you can really feel good about! When you buy one of these lovely hand made scarves it helps to fund mammograms for women in need! We particularly like this intricate pattern and modern colors of these hand made alpaca wool scarves, but there are plenty of other styles and colors to choose from. 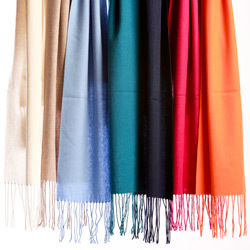 These cashmere scarves are luxurious, colorful, and elegant - great for staying warm and for pairing with your professional work attire to look effortlessly chic. We love vintage looking items! This cream colored crocheted scarf is simply charming and sure to keep you cozy! 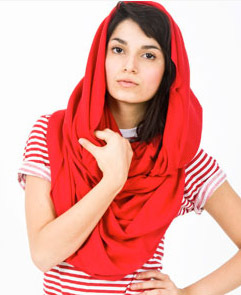 Speaking of vintage, how about an infinity scarf (aka: snood)? This popular accessory from the 1940's has morphed from a hairnet to a ski slope staple in the 1950's to it's tubular shape you see today that lets you wear it in a variety of ways! And, finally, you can never go wrong with a great plaid scarf! Plaid lets you incorporate all the colors you like in a way that is classic and sophisticated.